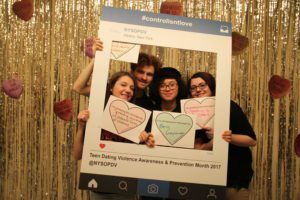 Troy High School was selected by the New York State Office for the Prevention of Domestic Violence (OPDV) to help kick off February as Teen Dating Violence and Awareness and Prevention Month. The “Control Isn’t Love” social media campaign, announced by Governor Andrew Cuomo on February 1, seeks to educate teens and adults about the signs of teen dating abuse and where to seek help. Troy High School was selected due to the activities of the We As Voices and Educators (WAVE) Club. The student group is committed to social change, specifically in the area of stopping violence against women, girls and LGBTQ people and fighting sexism that affects both men and women. The Club and their advisor, Student Assistance Counselor Bruce Margolis, work with Unity House developing young people into leaders who can advocate and educate others about these issues. Officials from OPDV, the state Office of Victim Services (OVS) and Unity House joined students in decorating paper versions of candy conversation hearts with positive messages about healthy relationships, instead of traditional sweet nothings such as “Be Mine” and “I Love You.” They will send these “virtual valentines” by sharing photos of themselves and friends on social media to start a conversation about teen dating violence and how it can be prevented.